Etchmiadzin (Ejmiatsin), sometimes referred to by its old name of Vagharshapat, is the spiritual centre for seven million members of the Armenian Apostolic Church. It has been a centre of spirituality since Armenia became the first nation to adopt Christianity as a state religion in 301 AD. It is also the seat of the Catholocos of All Armenians, the head of the Church. Etchmiadzin was founded in 685 BC. 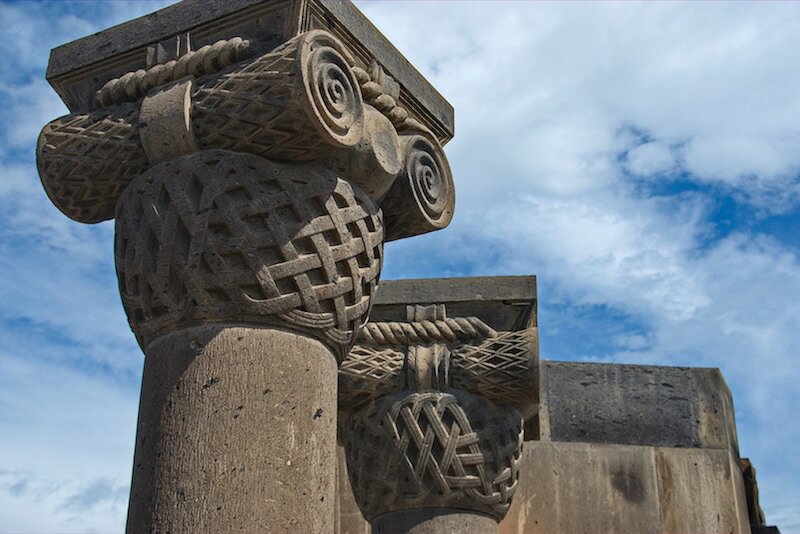 Today it is the fourth-largest city in Armenia and has a population of more than 57,000. More than 200,000 pilgrims visit the city each year. Its Cathedral is one of the oldest in the world – one reason why the city is a UNESCO World Heritage Site. Development of a Green Hospitality film. The Mother Cathedral of Holy Etchmiadzin is one of the oldest churches in the world. It was first build in 301-303 by Armenia's patron saint, Gregory the Illuminator. Armenia had just adopted Christianity as a state religion (the first in world history). The Cathedral has since been enlarged several times. Apart from the Mother Cathedral, the city contains other important Armenian churches and cathedrals. The Cathedral of Etchmiadzin, the Churches of Saint Hripsime, Saint Gayane and Saint Shoghakat, and the Archaeological Site of Zvartnots are listed as a UNESCO World Heritage Site. 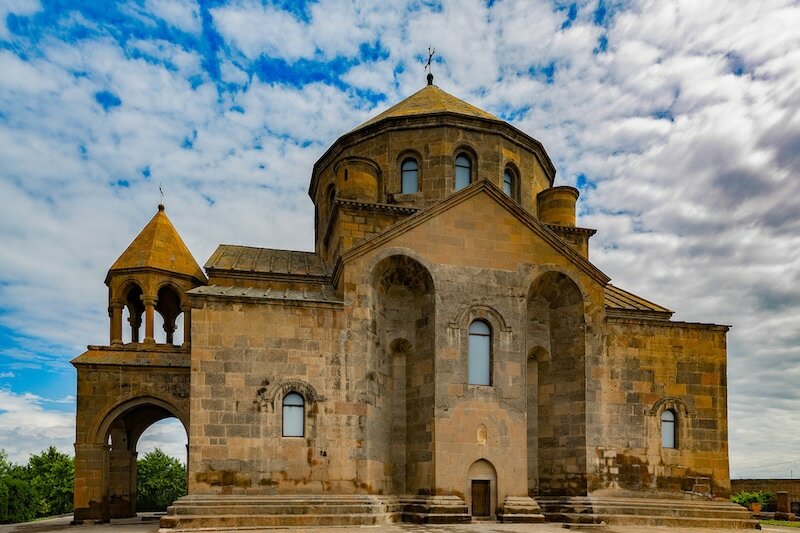 Built in 618, Saint Hripsime Church is considered one of the oldest surviving churches in Armenia, and is known for its fine classical architecture. The church was erected over the mausoleum, built in 395, which contained the remains of the martyred Saint Hripsimé. 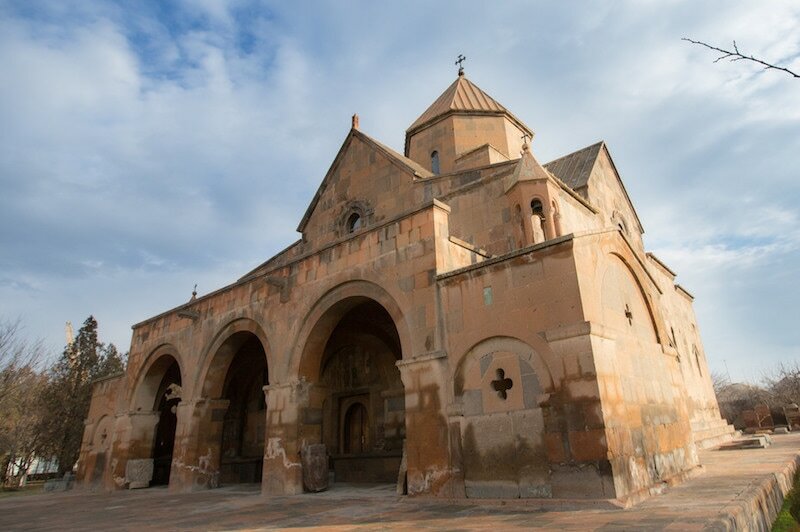 Built in 630, Saint Gayane Church (above) is noted for its harmonious proportions. 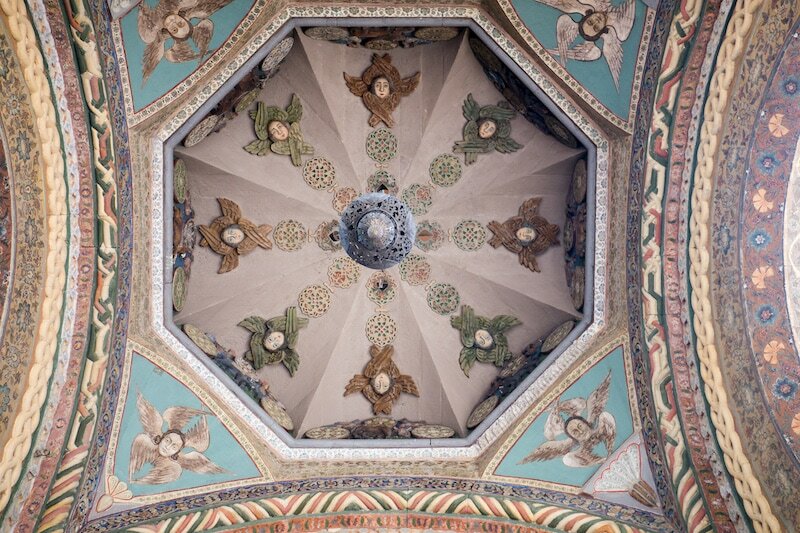 Its design has remained unchanged despite some renovations of the dome in 1652. Meaning 'the drop of light', Saint Shoghagat Church is a domed single-nave basilica, completed in 1694, and built with red and black tufa stones. 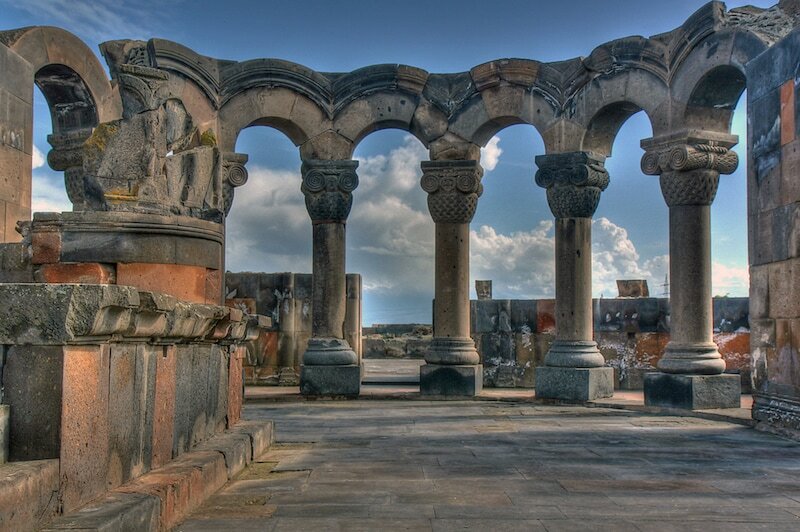 Zvartnots is a ruined 7th century circular Armenian cathedral built in 641-653. It was a majestic cathedral dedicated to St Gregory the Illuminator built where a meeting between king Tiridates III and St Gregory is supposed to have taken place, after which Christianity was adopted as state religion in Armenia. In 930 AD, Zvartnots Cathedral was ruined by an earthquake, and remained buried until its rediscovery in the early 20th century. The site was excavated between 1900 and 1907, and this process uncovered the foundations of the cathedral as well as the remains of the Pontifical palace and a winery. 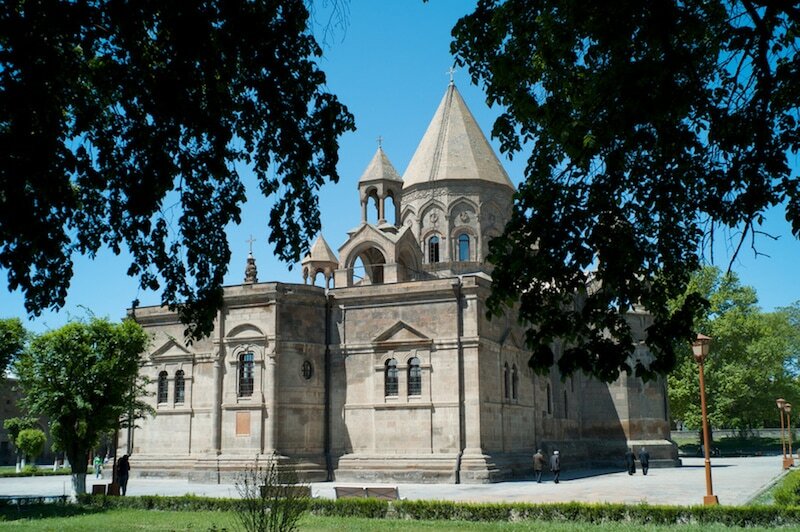 ​One of Etchmiadzin's inspiring initiatives is its Green Hospitality Project. This is a small canteen set in five open air pavilions and gardens planted with apricot, peach, pomegranate and walnut trees. It serves traditional cuisine, using locally sourced and sustainably produced food, and is visited by up to 3,000 viistors a year. The canteen follows the food targets outlined in the GPN Handbook which say that food should be 70% fresh or unprocessed, 50% local, 30% organic and 100% free-range eggs. ​green activities in the city. They include ​this video on the production of monastery honey. This forest once stretched 100 ha around the city but now is reduced to 8.5 ha around the 7th century St Gayane Church. Etchmiadzin has planted 7,000 trees in the last four years, and established many green parks in the city. There are also plans to fence the entrance to Nersisyan Forest to protect it from vehicles. In the mid 19th century, the Catholicos of all Armenians Nerses the 5th Ashtaraketsi (1843-1857) ordered that 30,000 trees be planted in Vagharshapat. The resulting forest surrounded the Mother See of Holy Etchmiadzin, stretching for 100 ha around the city. Nersisyan Elm Forest, as it became known due to the large number of elm trees planted, became one of the wonders of Araratyan valley. From a distance the town looked like a small island in a green sea. However, the Nersisyan Forest was seriously damaged in 1915-16 during one of Armenia's most tragic winters, when thousands of Armenian refugees from Western Armenian Van and Alashkert filled Vagharshapat. Most were forced to sleep in tents and in the freezing conditions they cut down thousands of trees from Nersisyan Forest for bonfires. The forest also suffered greatly in the early 20th century. Later, in Soviet times, mulberry trees were planted here. However, the trees were once again cut down during the 1990s to save the residents of Etchmiadzin from the bitter cold. The territory of the Nersisyan Forest now stretches just 8.5 ha around St Gayane Church. ​close up of pillars by Uwe Brodrecht; Armenian forest, by Raffi Youredjian.